Sardinia is officially declared now my favourite beach holiday. The best of beaches in abundance and spread all across the island. Relatively cheap. A good meal for 2 at a good restaurant with house wine would cost approximately 25 Euros. Properly directed roads for an easy and comfortable driving. Comparatively small island so the length can be covered in roughly 3.5 hours. 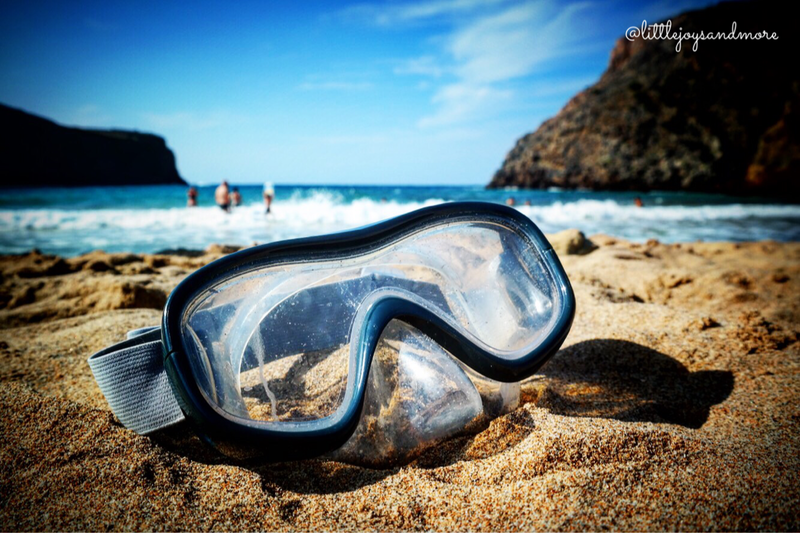 Marine protected areas and crystal clear waters make the diving and snorkeling experience memorable. Good food, good wine and good tiramisu- pretty much sorted! We landed in Cagliari and stayed there for 4 days. We explored the oldest, recommended and most admired attractions and beaches in Sardinia. We rented the car from Nellogiare. I got an amazing deal for just 55 euros for an economy car for 4 days from rental cars. Got a free upgrade to Opel Mokka (compact category), and rest is history!! I would have loved to check-in first but the BnB that we chose had specifically mentioned the check-in time to be between 6 and 8 pm. So we decided to drive further to explore the beaches than to repent on an early morning flight. 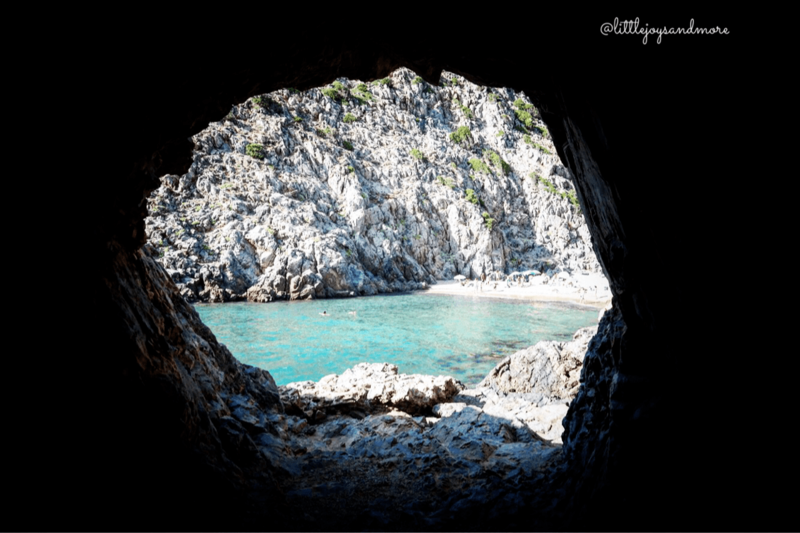 Sardinia is known for its beaches and Tuerredda ranked amongst the most recommended beaches from bloggers all across the world. Indeed, the beach was divine. White sand and crystal clear water- I could not have asked for more! And since it was the first week of September, it was not too crowded. The water was pleasantly cold and the weather was sunny- all the more a reason for us to remain in the water! We carried a bedsheet with us and bought the beach umbrella for 15 euros from a local vendor there. The beach promised a perfect start to the day and to the holiday that we were craving for. Honestly, I have no pictures of this beach. We dedicated this day for relaxation, hence left all our electronics in the car. Snorkelled for hours, slept on the beach, had a drink or two- no regrets to life! Cheers! They say a good start is a half work done. Exploration started on a good note, but we could not loose on the momentum. So we chose the next beach which was at par with Tuerreda. Turns out, it was even better! Porto Nico: The beach had its own charm, its very own charisma and indeed it was quite inviting and interesting. Few locals were relaxing on the beach on a fine Saturday afternoon, proving its popularity in that region. Sitting there on the white sand, looking at the sea, evaluating life and cheering to all the moments…I didn’t realise when it was finally time for us to leave. As I admitted, we refrained from all electronic devices this day, I hope my word would make a statement here to justify the beauty and sanctity of this beach. Non EUs are advised to get their international driving permit. I generally prefer opting for full insurance for the rented car as we are on a holiday and don’t want any unnecessary stress related to minor scratches and damages, if any. Parking at Tuerreda was 7 Euros for the whole day (at the time when I was there ie. September). Most of the beaches have 50 percent reduced parking rates after 2 pm. There are multiple vendors on the beach selling clothes, hats, glasses, beach accessories etc. Bargaining is definitely an option. Parking at Porto Nico was 3 Euros. This was the reduced afternoon price. We chose to stay at La Magnolia, a BnB in Assemini near Cagliari and almost one hour drive from Chia and Villasmius. The host was very friendly and courteous, had lots of recommendations for us and made sure we were comfortable at her place. We had dinner at Il Maratoneta, a few meters walking distance from our stay. Simple, elegant food. Cost for 2 with wine: 25 Euros. 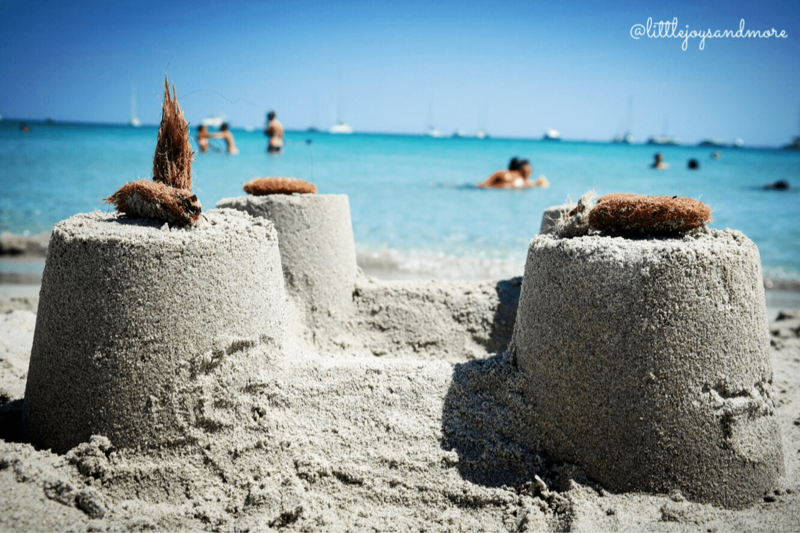 We started with Spaiggia del Giunco– a white sand beach with no boundaries and luxuriant transparent water. The beach in itself was a delight. By this time I have accepted that gods have created Sardinia for the sole purpose of human pleasure. Let me tell you here a very interesting story. I booked the flights to Sardinia, confusing it with Sicily and was excited to get the return tickets for 2 for just 100 CHF. (Don’t believe me if this is possible to buy tickets so cheap? Check out my tips here.) Well, I kept regretting my booking till the time I finally reached the island. Only to realise that after spending four days in this beautiful island, it was God’s own way of blessing me with a joyous weekend. Destiny!!! I tell u!! Well continuing further on my itinerary, here comes the surprise element I was talking about. The Scuba dive. An experience within an experience- something that I always crave for. This was our second scuba dive after the first in Canary Islands and we chose Airsub diving in Villasmius. 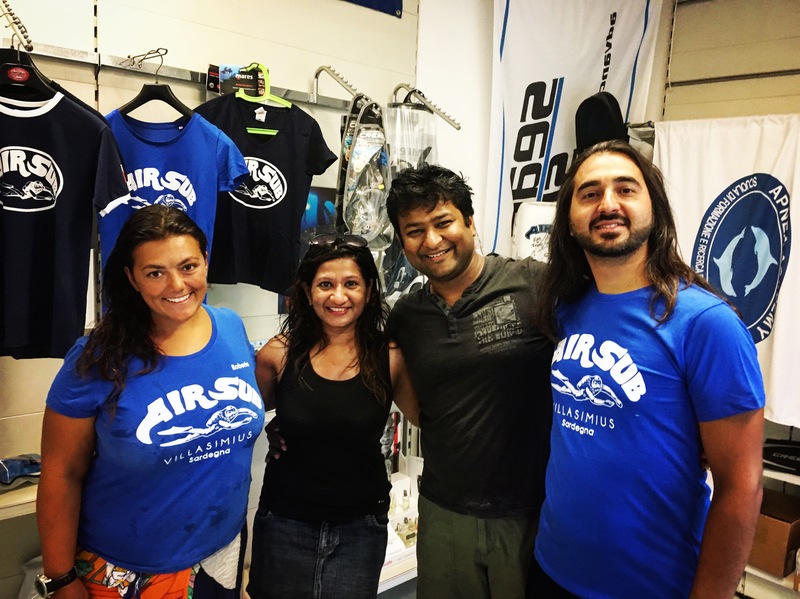 The cost was 75 Euros per person including all equipments and photography of the dive. 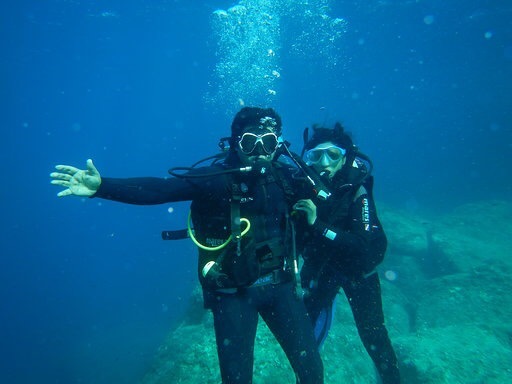 After a brief introduction to the instructions and the process, with professional guidance, we both were geared to plunge into the waters of Marine protected area to experience an eternity. Life under water is a miracle. Each aquatic specie carries its own identity that is exclusive and exquisite. As I crawled at a depth of almost 6-7 meters, I revelled a life that was unexplored and so worth to explore. I would highly recommend Airsub diving. Both Bruno and Rebecca were very professional, cordial and helpful. Right from the equipments to the instructions, they explained us every move in detail and assured their support at all times for making this experience unforgettable. They held our cylinder tanks from the back, so we could easily balance our body weight under the water and only focus on the experience. Needless to say, our comfort and safety was their prime motto and they successfully lived up to it. It was a tiring day after the dive and we chose a local restaurant in Assemini to end the day. Also read: Why you should include Iceland in your bucket list? Day 3: Break to the beach.. or we just thought we could do that in Sardinia. 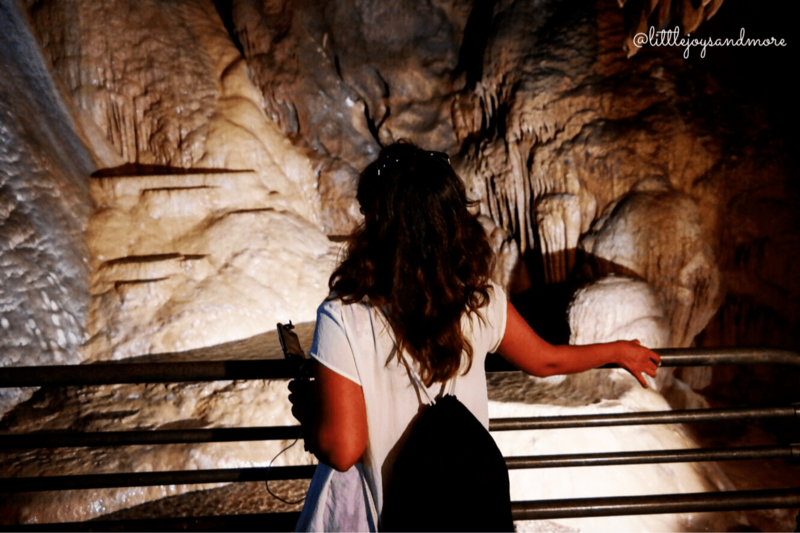 We started this day exploring the caves of Su Mannau– one of the oldest caves in Sardinia. 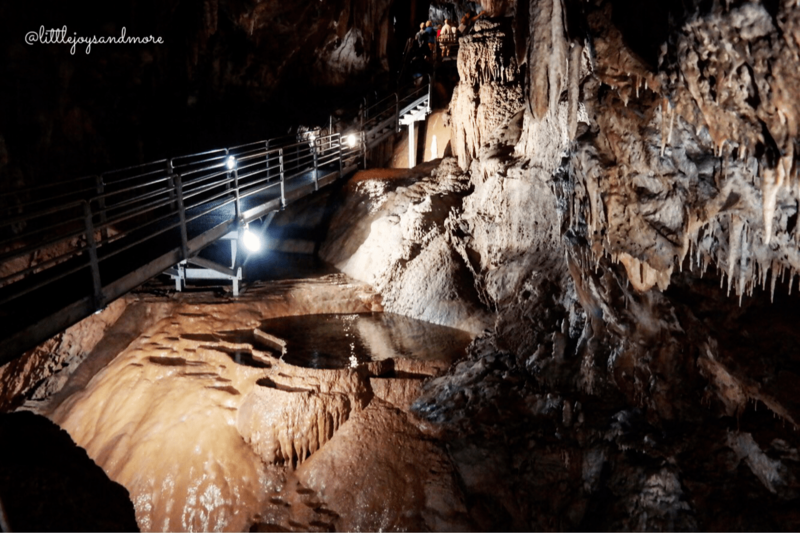 The story says that there used to live an ugly and a desolated ogre who with his tears created these formations and the ponds inside the caves. There is a also a symbol of worshipping the goddess of water- oil lamps preserved till date. 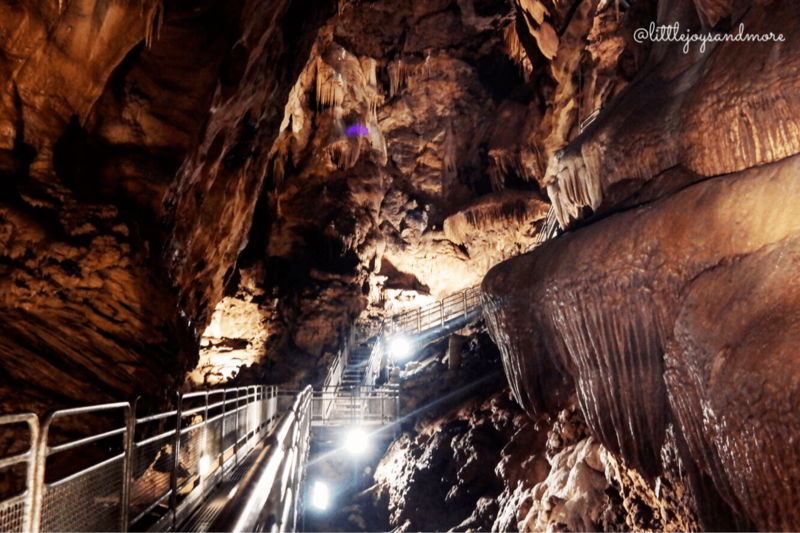 The most striking features of the caves were the stalagmites and the stalactites that grow by 2-3 cms in millions of years. One of them was 3 meters long, indicating how ancient and primeval these caves are. There is also a pond called Stenasellus which is named after a transparent fish that can only be found here. Over the centuries, the newly evolved fishes are more adaptable to the temperature and humidity of the caves and are very well preserved. The tour is in French and Italian and takes almost an hour. There is a reading material available in English that explains all the formations and stories of the cave. Overall, I would include it as a must experience in Sardinia. There is a small cafe near the caves for drinks and ice-cream, that gave us good time and shade to google the nearest restaurant for lunch. We found this beautiful, cozy restaurant right on our way, just 10-15 mins from the caves. It is called Bar Trattoria. Good food, good wine, garden-like ambience and a soulful service- we were geared to explore next! I really thought to take a beach- break this day (I am not kidding.. I did not even carry my swimsuit), but turns out it’s impossible to even think about it in Sardinia. We planned to explore the west. Cala Domestica is an obvious choice for west. 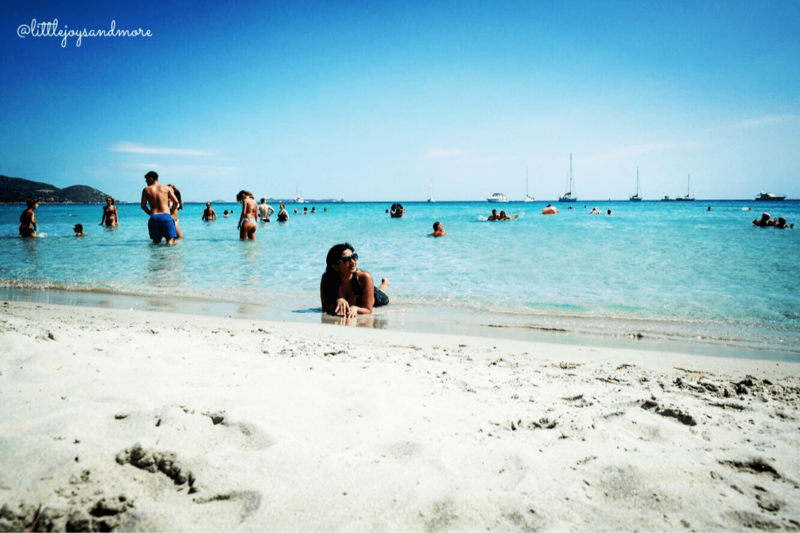 One of the popular beaches and recommended by many other bloggers, Cala Domestica was much better than my expectations. 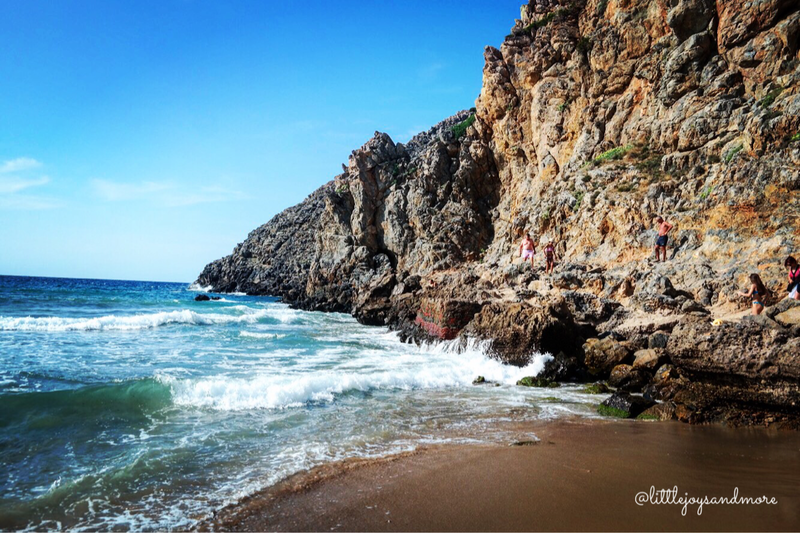 Hedged between two mountains, the beach offers a vision of a distinctive landscape. West, in general, is defined by strong winds and a discrete topography. Brown soft sand and pearl white water, it is always a good idea to discover the hidden beaches, hike over the mountains and to relish a slice of pizza. Cala Domestica was undoubtedly the most appealing beach in west of Sardinia. Since, we were still missing a visit to the capital, we decided to end the day with a gala dinner at Cagliari. A local suggested us the restaurant Antica in the main part of the city. We tried their local specialties that included Fregola with seafood and Culurgiones, prepared and served to perfection. Time please stop. I am yet to overcome my obsession or let’s say my addiction to beach. This final day, I had a choice either to visit Cagliari or visit another beach. Considering my love for beaches, the decision was pretty much one-sided. We took a long drive of 3.5 hours one way to fulfil our quench for the beachlust- we reached the Prince’s beach. The elegance of the beach cannot be defined in words. If you are a beach lover as I am, this beach is like a paradise. The parking is expensive and there is a small shop that offers only beers and pizzas for ofcourse a hiked price. Owing to its popularity, beach is definitely more crowded, but having said that, definitely worth a visit. Cheers to the sheer joy of living. While I was returning back, it was difficult to say goodbye to Sardinia. But then, time and waves wait for nobody! Keep following my travel journal and join the conversation on my social media. Thanks for reading.